Cyamopsis psoraloides (Lam.) DC., Dolichos psoraloides Lam., Psoralea tetragonoloba L.
Guar (Cyamopsis tetragonoloba (L.) Taub.) is an erect, bushy annual herbaceous legume up to 3 m high, with trifoliate leaves up to 10 cm long, and white or rose coloured flowers. The pods are straight, hairy, pale green, up to 12 cm long and contain 5 to 12 hard seeds (beans) each. However, the plant morphology is highly variable. Guar has a deep tap root system that can find moisture well below the soil surface (Ecocrop, 2010; Undersander et al., 1991; Wong et al., 1997). Guar is a multi-purpose plant, mostly used today as a source of galactomannan gum, which is used as a thickener and stabilizer in foods such as salad dressings, ice cream and yoghurt. The gum and the water-soluble resin extracted from the seeds are also used in other industries, including paper manufacturing, cosmetics, mining and oil drilling (Wong et al., 1997). In 2008, India accounted for 80% of the world trade of guar gum and guar seed was among the top 3 agricultural commodity traded on Indian bourses (Mishra, 2008). The sweet and tender young pods are consumed as a vegetable or snacks in North-west and South India, and the mature seeds can be eaten during periods of food shortages. Young pods and fresh or dry forage are used as livestock feeds. The plant is also used as a green manure and cover crop. Guar yields up to 45 t/ha of green fodder, 6-9 t/ha of green pods and 0.7-3 t/ha of seeds (Ecocrop, 2010; Ecoport, 2010; Undersander et al., 1991; Wong et al., 1997). Guar meal is the main by-product of guar gum production. It is a mixture of germs and hulls at an approximate ratio of 25% germs to 75% hulls (Lee et al., 2004). A protein-rich material containing about 40% protein in the DM, it is used as a feed ingredient, but may require processing to improve palatability and remove antinutritional factors (see Potential constraints below). In addition to the regular guar meal ("churi"), some Indian manufacturers sell a high-protein guar meal ("korma"). Guar is mainly grown in the semi arid and subtropical areas of North and North-West India (notably in Rajahstan) and East and South-East Pakistan. Guar does not exist in a wild state and is believed to have originated from an African species imported to India as horse fodder by Arabian traders (Ecoport, 2010). It later spread to other Asian countries, including Indonesia, Malaysia and the Philippines, and is now grown in many parts of the drier tropics and subtropics. Its value as a gum-producing crop was recognized during the second World War in the USA (Wong et al., 1997). Guar is hardy and drought-tolerant. It is well adapted to arid and semi-arid climates with hot temperatures but can grow in sub-humid conditions, from sea level up to an altitude of 1000 m. Drought stops growth and the plant sprouts when rain resumes. It is grown without irrigation in areas with 250-1000 mm of annual rainfall and most seed production occurs in areas with less than 800 mm. However, guar responds well to irrigation during dry periods but does not tolerate waterlogging. Excessive rainfall and humidity affect fertilization, pod development and seed quality. In high rainfall areas, guar is more leafy and more suitable as a green manure and fodder crop. Guar grows well under a wide range of soil conditions and is tolerant of low fertiliy, soil salinity and alkalinity. It performs best on fertile, medium-textured and sandy loam alluvial soils but does not tolerate heavy black soils (Ecocrop, 2010; Ecoport, 2010; Undersander et al., 1991; Wong et al., 1997). In the manufacture of guar gum, the germ and the husks are removed by grinding and dry heating to obtain the guar "splits" (endosperm). The resulting by-product consisting of germs and husks, or guar meal, is used as a protein-rich feed material. The splits are subjected to various treatments including being hydrated, flaked, dried, finely ground and then purified, chemically processed and blended, to produce guar gums having specific properties, such as particle size, gel-making and water-binding abilities, as required by specific food and industrial applications (CEC, 2007; Wong et al., 1997). Several treatments, including enzymes (cellulase, hemicellulase, β-mannanase), heat treatments and fermentation have been proposed to improve the nutritive value of guar. Autoclaving guar meal can destroy the haemagglutinins and trypsin inhibitors but has little impact on the saponin and phytate contents (Rajput et al., 1998). Like other legumes, guar improves nitrogen availability in soils and the ploughed crop residues have been shown to increase significantly the yields of succeeding crops (Wong et al., 1997). It is used in the reclamation of low fertility, high salinity and high alkalinity soils (Ecoport, 2010). As a soil improver, guar is used in rotation or intercropped with maize, sorghum, wheat or vegetables, or as a cover crop in rubber and coconut plantations. It is also a shade provider for plants such as ginger and turmeric (Undersander et al., 1991; Wong et al., 1997). Guar meal is an interesting feedstuff due to its relatively high protein content, 40-45% DM for the regular meal and 50-55% DM for the korma meal. Its lysine (1.72% DM) and sulphur amino acids (methionine + cysteine 0.96% DM) contents are comparable to those of groundnut meal but much lower than those of soybean meal (Feedipedia, 2011). Its main issues for all species are palatability and content of antinutritional factors. The current manufacturing of guar meal involves toasting, which destroys antitrypsic inhibitors and haemagglutins, but problems caused by the gum content may still require further processing. Guar meal is usually suitable for ruminants and to some extent can replace other protein sources, but its use in monogastrics is more limited. Guar meal contains about 12% gum residue (7% in the germ fraction and 13% in the hulls) (Lee et al., 2005), which increases viscosity in the intestine and reduces digestibility and growth (Lee et al., 2009). Guar meal contains other types of antinutritional factors: trypsin inhibitors, saponin, haemagglutinins, hydrocyanic acid and polyphenols have been identified (Verma et al., 1982; Gutierrez et al., 2007). However, anti-trypsic activity was found to be lower than in heat-treated soybean meal and isn't therefore the main cause of the antinutritional effects of guar in poultry (Lee et al., 2004). The large saponin content of guar seed (up to 13% DM) could have both antinutritionals effect and a positive antimicrobial activity (Hassan et al., 2010). In 2007, batches of Indian guar gum imported to Europe were found to be contaminated with PCP (pentachlorophenol, a chemical used as an insecticide and fungicide) and PCP-related dioxins, up to 1000 times above the legal limit. An EU mission sent to India could not determine the source of the contamination, but found that PCP was used extensively in the production of guar gum and that the controls in place were inadequate. The mission team also found guar splits contaminated with dioxins, though not related to PCP and likely to have come from another source (CEC, 2007). Guar was found to be not very suitable for grazing due to its hairy leaves and unpalatability (Göhl, 1982). Guar is sometimes grazed to reduce the risk of bloat in ruminants (Wong et al., 1997). Palatability improves after cutting and wilting (Göhl, 1982). The best time for cutting guar for fodder is during flowering and early pod formation (Wong et al., 1997). In sheep, guar forage from two successive cuts was found to be palatable and digestible, with a DMI of 2.42% LW (Abd El-Baki et al., 1997). When offered ad libitum, it was more palatable than Cenchrus ciliaris straw and Vigna aconitifolia forage and resulted in higher dry matter intake and live-weight gain (Mathur et al., 2005). Guar hay cut at flowering was able to maintain the body weight of rams for 45 days with a DMI of 2.44% LW (Patnayak et al., 1979). In goats, guar hay cut at pod formation gave identical nutrient and energy intakes and digestibility to the mixture of guar hay and crushed oats (Pachauri et al., 1986). 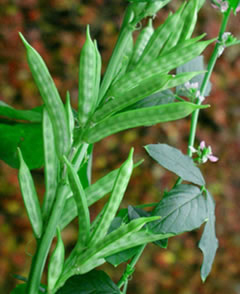 In lactating cows, guar crop residues containing the stems, leaves and immature pods left after threshing, compared favourably to cajan pea (Patel et al., 1972). Guar straw can be incorporated up to 70% in the diet of adult sheep to provide maintenance without any adverse effects (Singh et al., 2008). Crop residues are also used for feeding camels in the arid regions of India (Bhakat et al., 2009; Saini et al., 2006). Raw guar meal can constitute up to 25% of cattle rations. Processed meal can be used as the sole protein component of cattle diets (Göhl, 1982). Few nutritive values have been determined: total N degradability for expanded guar meal was in the 65-75% range and was influenced by the amount of heat treatment applied during processing. Total N degradability for unprocessed meal was 85% (Lund et al., 2008). The only reported OM digestibilities are 76% and 71% for the processed and unprocessed meal respectively (Islam Shah et al., 1964). In dairy cows, palatability problems have been reported when more than 5% guar meal was included in the diet. However, dairy cows and heifers fed rations containing 10-15% guar meal became acquainted to its odor and taste after a few days. Intake remained lower than with the control diet (cottonseed meal) but milk yield was not affected. In growing dairy calves, flavoured guar meal and toasted guar meal gave slightly better rates of intake and gain than raw guar meal during the first month of feeding (Rahman et al., 1968). In beef cattle, steers fed raw and toasted guar meal (2.8 kg/head/day with ad libitum sorghum silage) exhibited mild scouring and showed signs of reluctance to eat for a few days, but final average daily gain was comparable to that obtained with a cottonseed meal-based control diet (Conrad et al., 1967). In growing male buffalo calves, guar meal fed at 50% of ME intake was found to be a better energy and protein supplement than groundnut meal, being more digestible, and giving a better growth rate and feed conversion efficiency (Mandal et al., 1989a; Mandal et al., 1989b). The animals also showed a positive response in sperm motility, plasma LH and testosterone compared to those fed groundnut meal (Lohan et al., 1989). In lambs, guar meal diets initially resulted in disappointing growth rates, but after acclimatization to the diet growth rates improved and the animals showed signs of compensation (Huston et al., 1971). Sheep fed diets containing 50:50 guar meal and maize (ad libitum diets alone or ad libitum diets combined with grazing) had better meat yields than sheep grazing without a supplement (Rohilla et al., 2007). Rumen-protected (formaldehyde) guar meal supplemented with urea resulted in higher growth than raw or unsupplemented guar meal (Mathur et al., 1989). 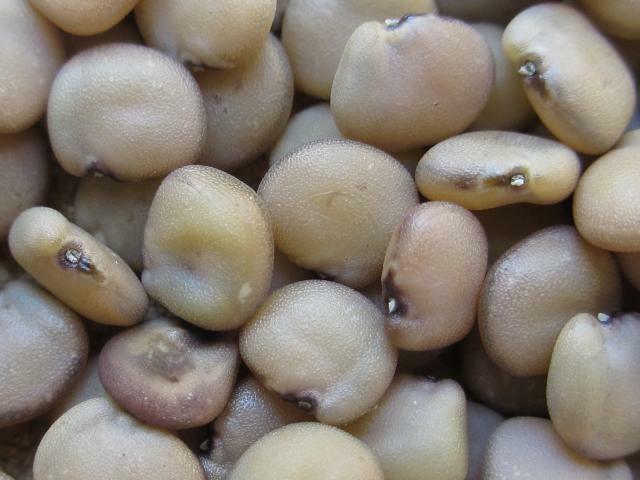 In a comparison of several legume seeds in the Southern Great Plains of the USA, the protein and in vitro digestible DM of guar seeds indicated that they could be efficient replacements for maize or cottonseed meal in livestock diets, assuming that guar could generate enough grain biomass to be cost-effective. Though not as effective as soybean, guar seeds were capable of accumulating useful levels of protein and digestible dry matter under the variable growing conditions of the study (Rao et al., 2009). Boiled (slow heat) guar seeds fed with wheat straw (40% of ME) to male buffalo calves resulted in adequate nutrients utilization and availability of undegraded dietary protein (Tiwari et al., 1990). Crushed guar seeds increased dry matter intake and digestibility when included at 150 g/head in Marwari ewes grazing sewan grass (Lasiurus scindicus) (Thakur et al., 1985). In growing pigs, guar meal included at 7.5% of the diet resulted in lower growth than the control diet (sorghum-soybean meal) (Tanksley et al., 1967). In growing-finishing pigs, the inclusion of guar meal up to 6% had no negative effects on growth performance. Guar meal included at 12% reduced growth without affecting pork quality (Heo et al., 2009). Replacement of groundnut meal with toasted guar meal in the diets of growing-finishing pigs did not affect body weight gain, feed consumption, feed utilization efficiency and digestibility (Khirwar et al., 1986). The addition of guar by-products in poultry diets may be a useful economic strategy for decreasing feed costs while maintaining production levels, provided that the inclusion rates are kept lower than 10 or even 5%. Treatment of guar products can improve marginally the value of the product. Reported TME for poultry are in the 10.9-11.3 MJ/kg DM range (Campbell et al., 1983; Nadeem et al., 2005). Raw guar meal depresses growth and feed efficiency in chickens at inclusion rates as low as 7.5% (Vohra et al., 1964b) and 10% seems to be the maximum rate acceptable (Patel et al., 1985). An inclusion rate of 2.5% untreated guar meal can support growth, feed consumption, feed:gain ratio, and meat yield equivalent to those of a corn-soybean meal diet (Conner, 2002). The antinutritional effects are more pronounced in young birds (Verma et al., 1982). 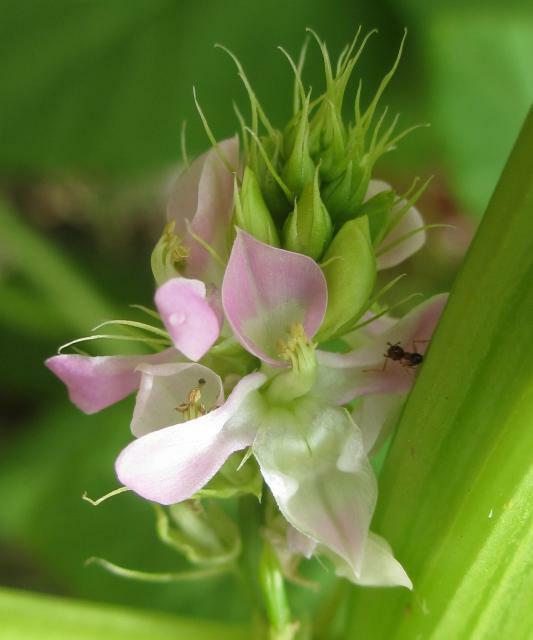 The residual gum present in the hull fraction (and to a lesser extent in the germ) is thought to be the main cause of the antinutritional value of guar meal. The gum increases intestinal viscosity, preventing the correct mixing of digesta and their contact with digestive secretions. It also causes watery and sticky feces (Lee et al., 2009). The effects on animal performance of other antinutritional factors present in guar meal, notably trypsin inhibitors, are less certain (Lee et al., 2004). Several methods have been proposed to improve the nutritive value of guar meal in poultry, with variable success. Steam pelleting, toasting, water treatment and methionine supplementation failed to improve performance in broilers, while the addition of cellulase, hemicellulase or β-mannanase, combinations of heat treatments (autoclaving) and enzyme treatment improved feed utilization (though not necessarily body weight) (Vohra et al., 1964a; Patel et al., 1985; Lee et al., 2003; Lee et al., 2004, Lee et al., 2005; Lee et al., 2009). Fermentation with Aspergillus niger or Fusarium sp. was also found to be useful (Nagra et al., 1998a; Nagra et al., 1998b). Autoclaving enhanced the stickiness of dropping, whereas hemicellulase prevented it (Patel et al., 1985). However, even for treated guar meal, the feeding threshold should remain as low as 5% to avoid problems (Lee et al., 2005). Guar meal included at 10% or more in the diet of laying hens decreased egg production and feed efficiency and diminished egg yolk color. Guar germs and guar meal were fed up to 5% in high-production diets for laying hens without unfavorable effects on egg production, feed consumption, eggshell quality and solid egg components, but affected negatively feed conversion, egg weight and total egg mass (Gutierrez et al., 2007). Up to 10% toasted guar meal in the diet replaced soybean meal in feed for layer ducks without decreasing performance (Nageswara et al., 2002). Up to 20% guar meal replaced groundnut meal in the feed of laying Japanese quails without affecting egg numbers or size (Verma, 1982 cited by Devendra, 1988). Feeding late-phase laying hens 20% guar meal with and without β-mannanase was found to be as effective in inducing molt as feed withdrawal, with the added benefit of improved resistance to Salmonella enteritidis colonization in molted laying hens. Supplementation of β-mannanase also enhanced resistance to Salmonella enteritidis (Gutierrez et al., 2008). In broilers, guar meal included at 5% of the diet showed anticoccidial activity against Emeria tenella. Saponin-rich guar meal extract exhibited antibacterial activity. Thus, guar products may have potential as an antibiotic alternative in poultry though it is still unclear if this effect is due to residual guar gum, saponin, or some unknown component of guar meal (Hassan et al., 2008). Guar forages from two successive cuts were found to be palatable and digestible in rabbits, with a DMI of 1.78% LW (Abd El-Baki et al., 1997). Guar meal should not be fed to growing rabbits as it depresses feed intake, body weight gain, feed conversion, dry matter and energy digestibility, even when it replaces less than 25% of soybean meal (Schurg et al., 1986; Lebas, 2004). However, guar meal could be fed up to 22.5% of the diet of weaner broiler rabbits (Prasad et al., 1998). In carp species, guar meal can replace part of the animal protein sources but high inclusion rates have detrimental effects. Guar meal can replace up to 50% of fishmeal protein in common carp fingerlings (Cyprinus carpio) but higher rates decreased protein, lipid and protein digestibility (El-Saidy et al., 2005). In rohu (Labeo rohita), guar meal included at 30% in the diet resulted in much lower dry matter, crude protein and energy digestibility than meat meal, but was still considered a valuable feed ingredient (Asad et al., 2005). Milled and pelleted guar seeds, raw or autoclaved, were fed directly to mrigal fingerlings (Cirrhinus mrigala). Feeding raw and autoclaved guar resulted in lower survival, weight gain and carcass protein, fat and energy content than for the fish fed soybeans, mung beans and cowpeas (Garg et al., 2002). Milled guar seeds could successfully replace up to 50% of fish meal in the diets of Nile tilapia, without adverse effects on feed utilization and growth, though more trials are necessary to investigate the long-term effects of such diets (Al-Hafedh et al., 1998). Swanek, S. S. ; Krehbiel, C. R. ; Gill, D. R. ; Gardner, B. A., 2001. Extent and rate of in situ ruminal degradation of protein byproduct feeds on a high concentrate diet. Anim. Sci. Res. Report - Agricultural Experiment Station, Oklahoma State University, P-986, 3 p.